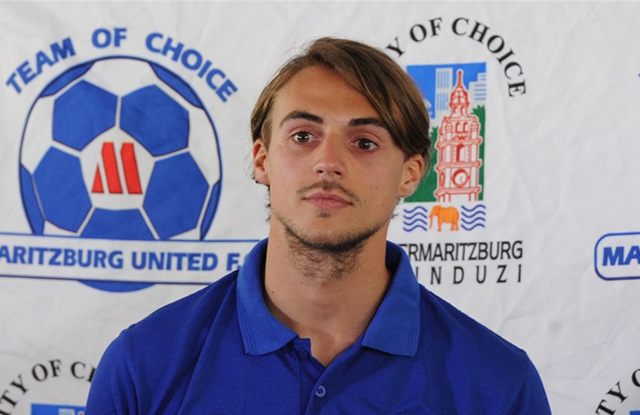 Belgium born striker Andrea Fileccia is looking forward to reuniting with head coach Ernst Middendorp and making and impact for Maritzburg this season. Fileccia loved playing football as a child growing up. And when he was 16 years old, he joined the Feyenoord Academy to further develop his football skills. "When I was 18, I played for the first division team in Holland, Excelsior Rotterdam FC for two years, I then went back to Belgium," said the striker. “When I came to South Africa, I got a chance to play under coach Middendorp, and I was doing well until I got injured in a derby match against Celtic," he explained. The first week in Maritzburg was a bit difficult for Andrea, being in a new City with new people. "But I’m okay now," he said, "I’m settling in and I’m responding very well on the field. I want to do well in Maritzburg,” said the striker who had scored six goals in eleven appearances in the PSL last season before he got injured. He is looking to playing with fellow striker, Evans Rusike: "He is a very good player, very strong and he can score goals. I think as a team we will do well,” Fileccia said. His message to the supporters is: “What is done is done. Last season is gone. This is a new year and there are some new players. The coach knows all the players very well, and as players we believe one hundred percent in ourselves. We have a very strong team and the spirit is good. This season is going to be very different from last season,” he wrapped up.